We arrived last Sunday, check in was easy and the room is very nice have a balcony overlooking the pool. Room is spacious and modern and they clean it every day. Pool areas are very clean pools and warm, lots of sun beds, clean towels provided. Had a nice pool for younger children. No much going on during the day just darts bingo and archery. The hotel is on the seafront in a quite part, can walk into town about 30 mins. The thing that spoilt our holiday was the food which is not very nice, it reminds me of the old days when everything is cooked in so much oil. The food is very bland no taste to anything. Apparently it caters for diabetics that’s why the jams are watery and don’t taste like jam. All the restaurants are self service we tried all three and the quality of food was not 4 star standard. Everything is chips with lots of fried food all dried up including pizza which was horrible. Nothing seemed to match they had veg but nothing really to go with it, curry’s without taste and after a couple of days it was a chore to find something tasty. The main restaurant is very big but the food is at one end so you have to walk far to get to your table. Some foods were just warm. They had hand sanitizer but not many people used this on entering the restaurants and many times saw people picking up food without using the tools provided, even saw a woman going round tasting food and putting the spoons back in the dish which was disgusting. New cooked food thrown on top of what’s in trays.They say they have a sports bar it’s tiny uncomfortable chairs with a couple of tvs. Around 10pm they bring a trolley round with pre cooked burgers and put in the fridge so you can microwave them at 11pm if you fancy a snack- we didn’t. The hotel is full of elderly people, I wish we would have known at the time of booking we would have gone somewhere else, nothing against them just everything here is geared up for the older clientele, they have a show every night but mainly consists of the people being the entertainment or up dancing to old music. The drinks all their own brand and taste weird, the cocktails are pre made couldn’t taste alcohol and looked tasted dreadful. I went to town got myself a drink to take back in the end. In the evening it gets cold and apart from the crowded entertainment bar and lobby bar where you couldn’t get a seat there was a couple of bars outside with no heaters. We spoke to the rep told her that we didn’t like the food it was bland and the drinks seemed watered down she noted our complaint, she also stated this hotel had the best reviews- I-cant see why. Overall this hotel is catering for the mass serving cheap food and drink they are not bothered about the quality and there were no little treats available that compliment the stay. The rooms had a thing on the wall of body wash but again no complimentary items. From the back of the hotel as you come out of your room you can see a small hospice with people in it. Which was sad and next to it a mortuary which wasn’t very nice to see. The complex apart from the pool areas are ok but it’s not very green more concrete everywhere. On a good note we walked to the train station and the train was cheap to get to Malaga €4.10 return per person. Went to Gibralter hired a car €30 a day. We have been to this chain before and it has always been really nice perhaps it’s because its Spain I don’t know but I wont be coming back. It was not worth the money. We booked this hotel for a week to celebrate my husband's 75th birthday in April 2017. I emailed the hotel to request a room on a high floor and they allocated us a room on the ninth floor in the building that was previously the Hotel Bella Playa. I was so pleased that they managed to honour our request because we had a lovely view and our room was ready on arrival. Having just been refurbished, we were one of the first to stay in this room. The room itself had been refurbished to a high standard and the bathroom had a walk-in shower that occupied the length of the wall....and two sinks. Each room also has a 4-6 code safe which you can use free of charge, with A/C in the room also free. By combining two hotels, it has made it a large complex, situated in the Los Alamos district of Torremolinos. 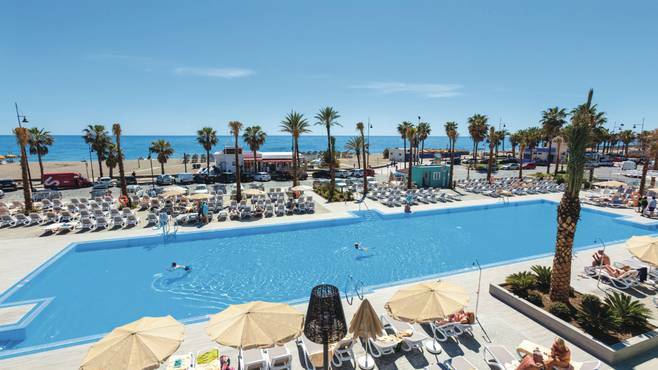 To get to Torremolinos centre, there are taxis available at end of street or use the local bus which stops on the opposite side of road of the main entrance or depending how fit you are, it's approx a 20/30 minute walk. La Colina railway station is about a 10 minute walk away from the complex. There are 4 pools, ranging in size from a large pool opposite the beach to a small shallow pool for the babies situated lower down the complex. There's also a Spa/Gym and indoor steam room/pool. There are several bars, I don't touch alcohol, so I can only comment on the tea and coffee... both were putrid and they ought be fined under the Trades Description Act. So, for a decent cup of coffee I had to go outside. I tried the orange juice 'on tap' in the restaurant just the once, once was enough, it was like drinking pure sugar. You have three restaurants to chose from. A Spanish restaurant and an Italian restaurant, as well as the main buffet one, however you have to book the Italian and Spanish ones at the reception. The Spanish restaurant was just a smaller version of the main one, offering more or less the same food, but, it was more civilised by having to be booked in advance. We didn't like the main restaurant, it's big and it was too busy, and depending where you sit, it's a trek up and down for food. The food was average and repetitive, typical mass catering. The animation team work very hard and at night it's cheap in- house entertainment. This doesn't go down well with me when there are excellent local artists begging for regular work. All Inclusive suits some people and in some parts of the world I recognise the merits of offering this type of holiday. Sadly, it's not our 'cup of tea' when the Spanish Costas offer so much more. Not really much more to say, we were not impressed and we won't be returning.